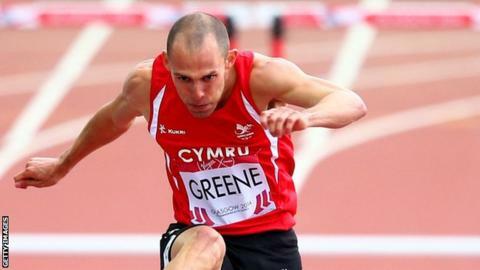 Wales' former hurdles world champion Dai Greene, 28, says fellow athletes suspect their Russian counterparts of cheating, describing doping allegations as "disturbing". A German television documentary has claimed to present evidence of systematic doping in Russian sport. The president of the Russian Athletics Federation has threatened legal action against "the slanderous allegations". The claims do not surprise Greene: "My first thought was, here we go again." "The athletes that have been successful for Russia in recent years, many of them who are going to be implicated in the scandal, I think athletes in general knew," he added. "You'd know as athletes who you suspect because you don't see them on the circuit, you see them maybe just at championships. "They train and compete maybe just in Russia all year and then all of a sudden they turn up at major championships and they're one of the best in the world. "You have to be very sneaky to catch these people. The current testing regime isn't good enough. It's all very disturbing." The German documentary, broadcast on Wednesday, also contended that the corruption extends beyond Russia and alleged that the International Association of Athletics Federations (IAAF) could be involved in a cover-up. The IAAF said it had "noted a number of grave allegations" and revealed that an investigation into some of the claims is "already ongoing". The claims have been rejected as "a pack of lies" by Valentin Balakhnichev, president of Russian Athletics Federation, who said in a statement on Friday that the documentary was "a planned attempt to create an ugly scandal within Russian athletics and Russian sport in general". British runner Jenny Meadows said on Thursday that it would be the "biggest doping scandal of all time" if allegations of widespread and systematic cheating among Russian athletes turns out to be true. Meadows, beaten to European gold by a Russian drug cheat in 2011, said the claims made her feel "sick". Double-Olympic 1,500m champion Lord Coe, 58, has been a vice-president of the IAAF, the body that governs world athletics, since 2007. He launched his manifesto for presidency election on Wednesday, promising to increase resources for anti-doping and to create a new IAAF ethics department. Greene, European and Commonwealth 400m hurdles champion in 2010, said: "It's an appropriate time for change, another scandal, another nation being looked at." The Llanelli-born athlete added: "All these things coupled together will build momentum for change, which can only be a good thing. "It's not going to happen overnight. Everyone needs to pull together for the greater good of the sport and needs to filter out this disease which seems to be infecting our sport."